2. 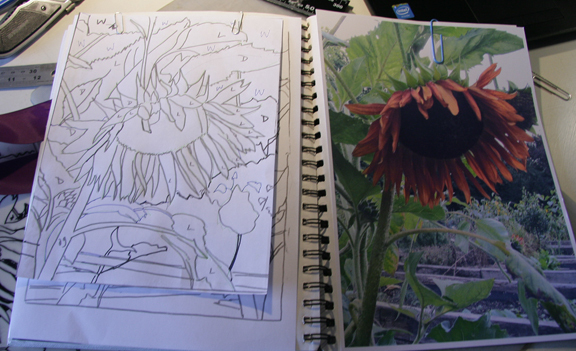 March 2017: I am making another reduction lino print from a photograph I took at Waterlow Kitchen Garden last summer – it will be good practice for this tricky method which means you need excellent registration and a good paper. I am still researching types of paper for printmaking. So far I have used Lotka successfully as well as recycled paper, Low gms Fabriano, cartridge paper which is a bit hard. I went to Cass Art in Islington and bought Fabriano which is nice, esp if it’s lightweight, anything else won’t print by hand. 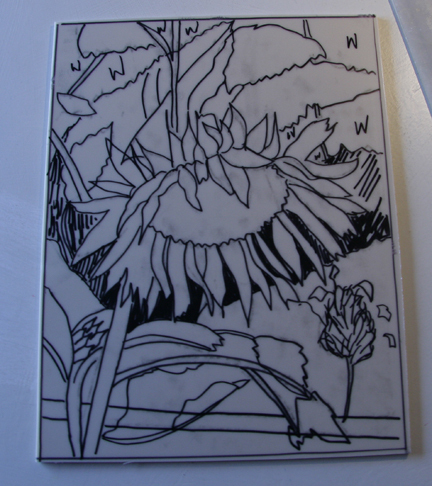 March 3rd: The lino block rolled up with red ink for the red petals of the sunflower. The red printed on top of the pale green and the final print a dark green. So what have I learned from this print above? Well, you need excellent registration and I don’t yet know how to do that, mine for this print used a cardboard base that the lino block sat in, with paper guides for the paper, but even 2 mm out of alignment can damage the final image. I only got 2 prints out of 6. 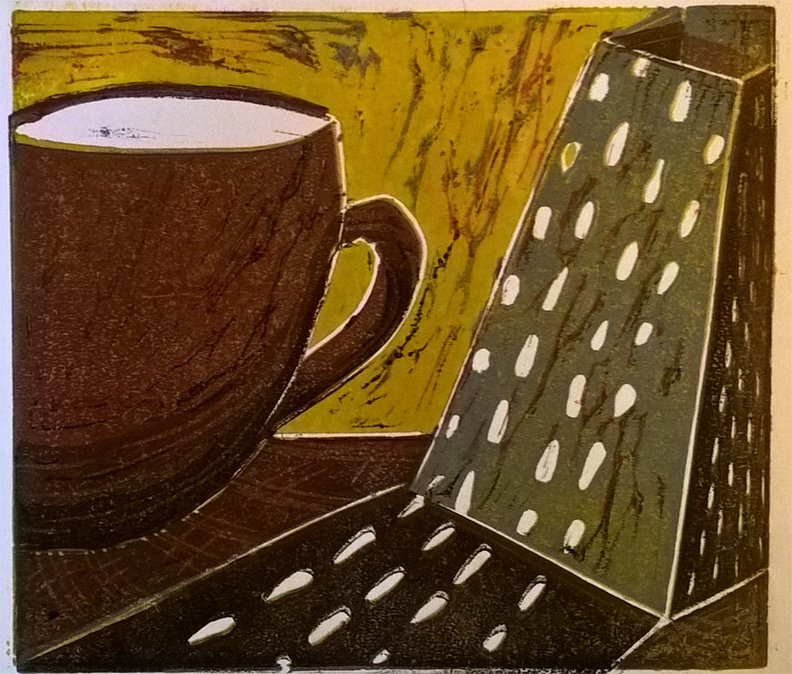 I decided that I’d dive in and have a go at a reduction lino print! 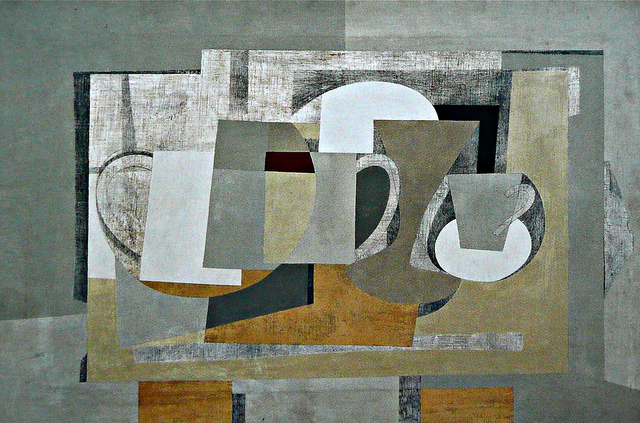 I have researched a colour palette, I like two from Ben Nicholson’s paintings – a St Ives painter of modernist works: His colours are relaxed cool colours. 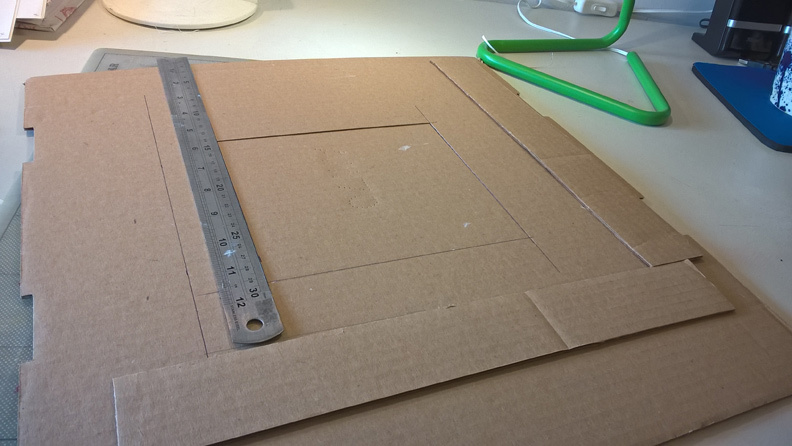 I also researched reduction lino methods and methods for creating a registration system – the best one was by Belinda Del Pesco, using cardboard with a hole for the block and paper guides. It worked really well and was clean and efficient method for printing multiple prints. 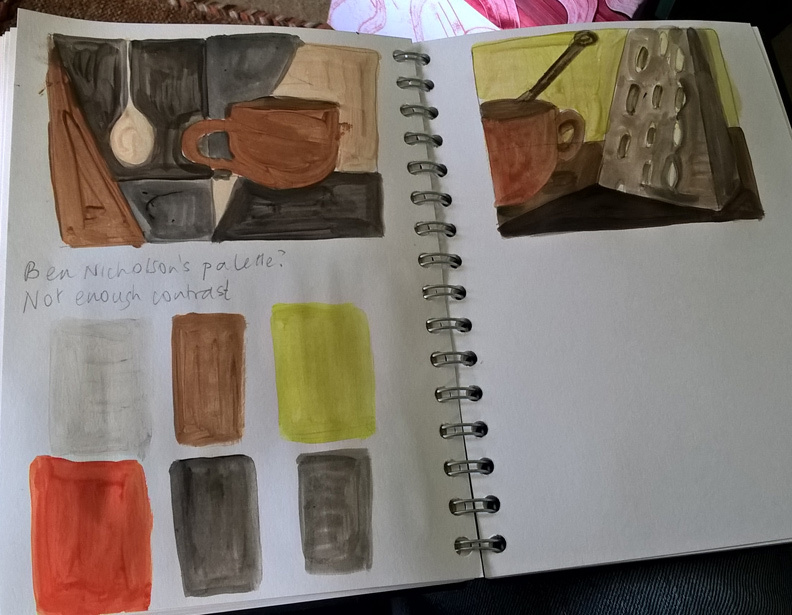 Some colour paintings trying to find colours for my print and a composition. 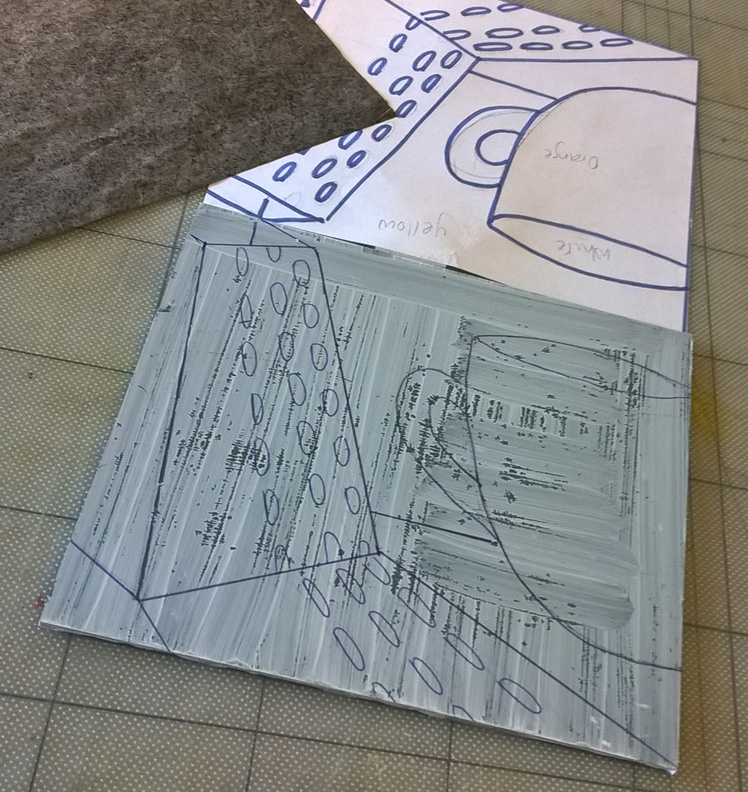 I transferred the drawing to my lino using carbon paper. I painted the lino white but it didn’t work very well. 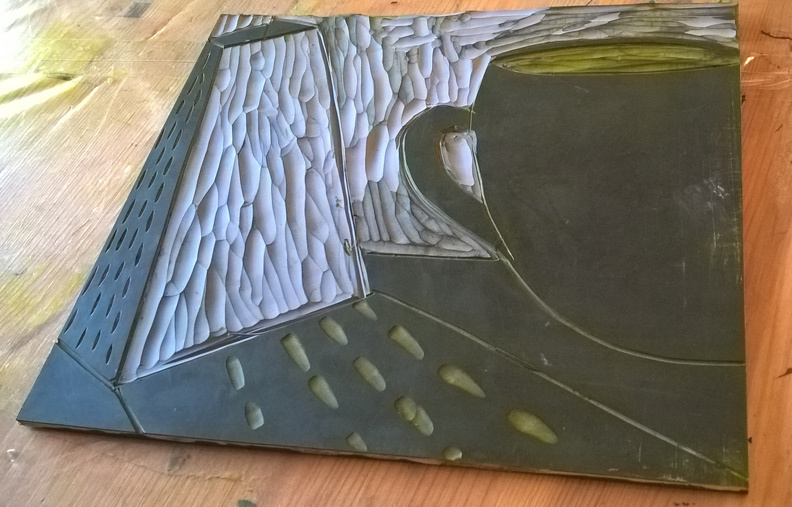 My lino was very shiny and not easy to draw on. I made a registration base out of card. I cut a hole in the carboard to fit neatly in the lino block. I then measured 2 inches on the left side and the top for the paper guide. 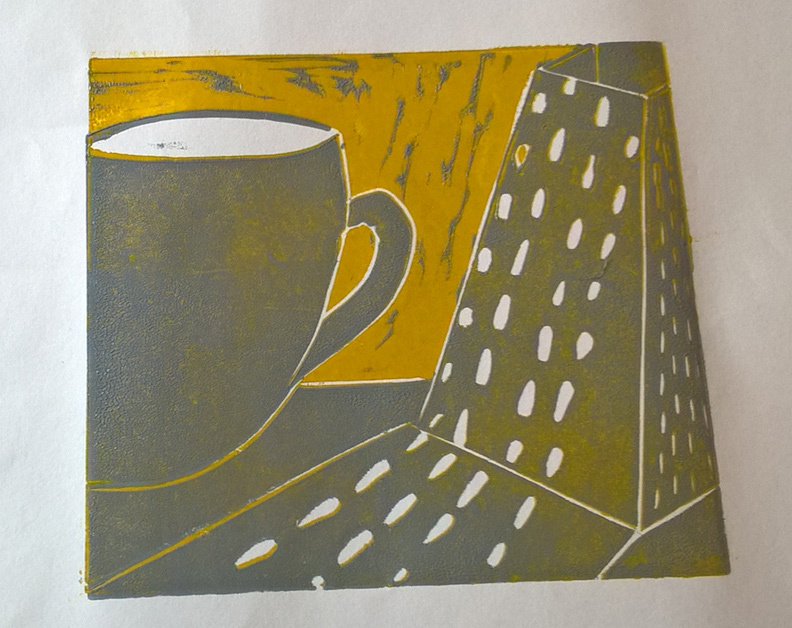 The Reduction Lino Print method means you first cut away the areas you want to leave white / no colour. You print your first lightest colour – in this case yellow. You then continue cutting away and printing the next colour until you finally arrive at the darkest colour. 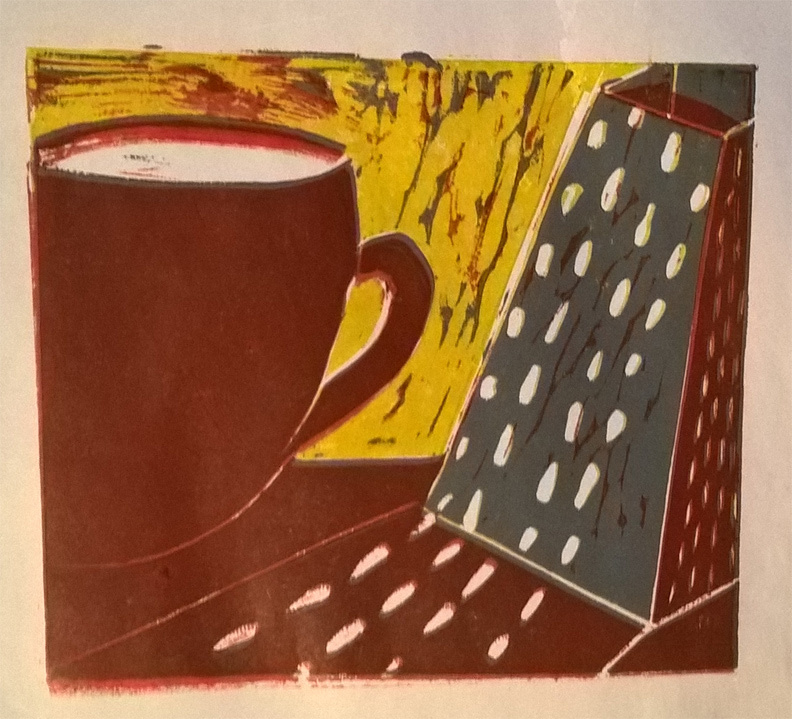 Here is the inked up block for the first printing of yellow – I have cut away the area to remain white, the cup top and the holes in the grater. 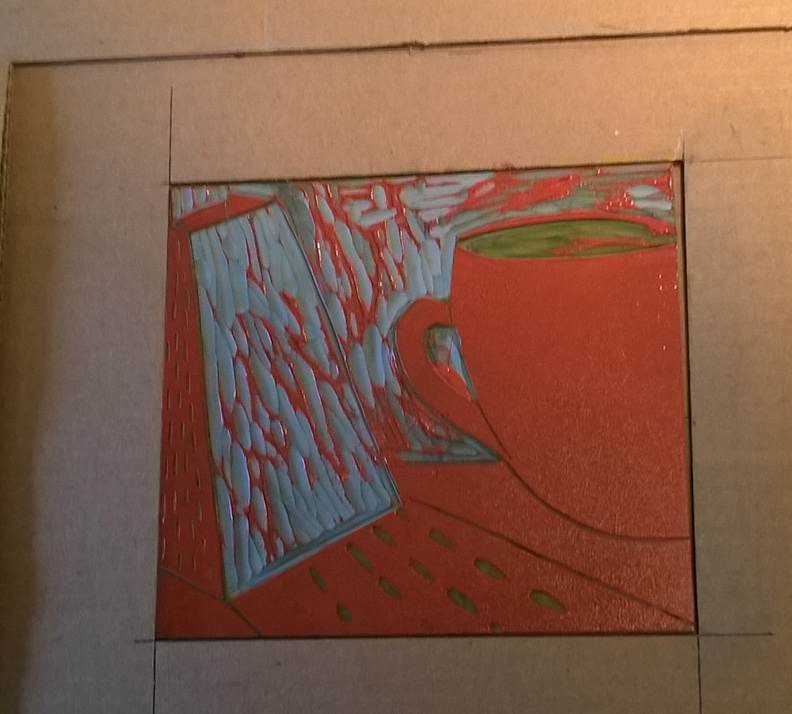 The lino fits well into the hole and I managed to do a five colour print session with the board remaining spotless! a first for me. 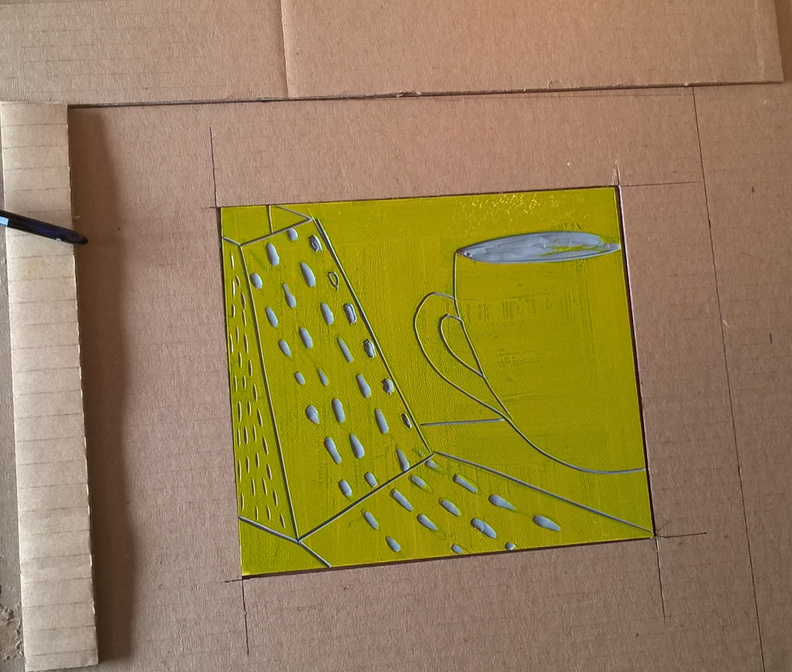 The lino with the yellow wall cut away and the front of the grater which was printed pale grey. the grey printed on top of the dry yellow print. Now I will cut away the part that I want to remain pale grey. 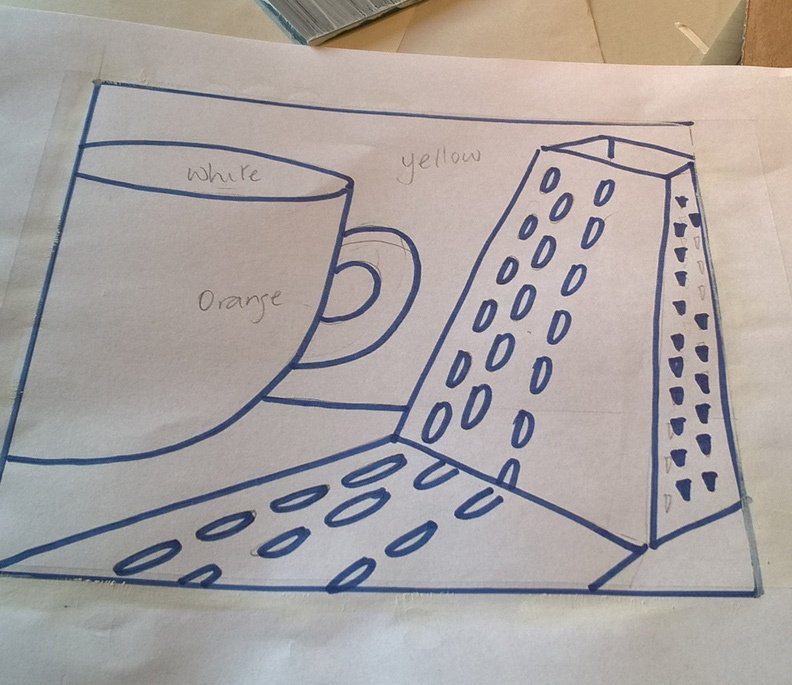 The next colour to print is the orange for the cup and the table cloth. I then cut away most of the cup and all of the table cloth. This print now has yellow, pale gray and orange. Next is dark grey, I used up some of the previous ink and produced a dark brown colour. This is the final print. I managed to keep my work space very clean. I was careful in cleaning up. The whole process from drawing to final print took 5 hours! Now I’m tired and will have a cup of tea and watch some tv!